South Korea‘s electricity output reached 105,866 megawatts in 2016 if all of its power plants operated at full capacity. By comparison, North Korea’s output was estimated at 7,661 MW. The difference is the largest since South Korea began to release related data in 1965. Past records show that South Korea‘s generation capacity grew 137-fold since 1965, while that for North Korea increased just threefold. 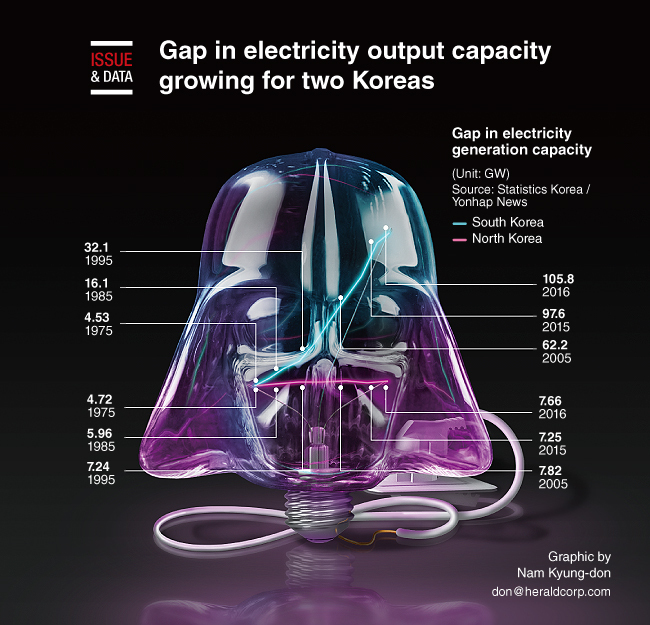 By 2005, South Korea’s electricity output capacity reached 65,514 MW, while North Korea‘s capacity effectively peaked at 7,822 MW, data said.